The backlash against the lashing out against presidential candidate Michele Bachmann has already begun. 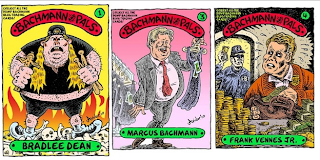 Following the Palin blueprint, Bachmann plans on fully leveraging the negative publicity with her base: they see leftist attacks as a point of pride and an indication of strength. This outpouring of disgust is coming at the expense of the excellent local bloggers in Minnesota who have long tracked and fact-checked Bachmann. Their work will be the uncredited foundation of probably every Bachmann hit piece you'll read between now and 2012. It's begun with the self-destructive chewing-out that Matt Taibbi gave Bachmann in Rolling Stone.